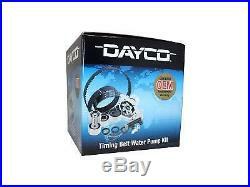 DAYCO TIMING KIT WATER PUMP FOR NISSAN SKYLINE R32 R33 R34 GTR RB26DETT RB26. Aug 1989 - Feb 1994, 2.6L, 6 cyl, 24V, DOHC, TTMPFI, Twin Turbo, KBNR32 GT-R, EngCode: RB26DETT, Import. Aug 1991 - Aug 1993, 2.5L, 6 cyl, 24V, DOHC, MPFI, ER32, EngCode: RB25DE, Import. Aug 1991 - Aug 1993, 2.5L, 6 cyl, 24V, DOHC, MPFI, KECR32, EngCode: RB25DE, Import. Aug 1993 - Mar 1998, 2.5L, 6 cyl, 24V, DOHC, TMPFI, Turbo, R33, EngCode: RB25DET, Import. Aug 1993 - Mar 1998, 2.5L, 6 cyl, 24V, DOHC, MPFI, R33, EngCode: RB25DE, Import. Jan 1993 - Nov 1998, 2.5L, 6 cyl, 24V, DOHC, TMPFI, Turbo, HR33, GTS-T, EngCode: RB25DET, Import. Jan 1993 - Nov 1998, 2.6L, 6 cyl, 24V, DOHC, TTMPFI, Twin Turbo, BNR33, EngCode: RB26DETT, Import. Mar 1998 - Dec 2000, 2.5L, 6 cyl, 24V, DOHC, TMPFI, Turbo, R34, EngCode: RB25DET, Import. Dec 1998 - Feb 2002, 2.6L, 6 cyl, 24V, DOHC, TTMPFI, Twin Turbo, BNR34, EngCode: RB26DETT, Import. Sep 1996 - Aug 1997, 2.5L, 6 cyl, 24V, DOHC, MPFI, E-WGNC34, EngCode: RB25DE, Import. Aug 1997 - Dec 1999, 2.5L, 6 cyl, 24V, DOHC, MPFI, E-WGNC34, EngCode: RB25DE, Import. Timing belt kit inc waterpump. Timing belt Teeth: 141 Width: 25mm. Timing belt seal kit (3 seals). Why replace the timing belt alone? Worn or wearing tensioners, pulleys and idlers can cause a new timing belt to fail in a very short time. A timing belt failure can result in costly engine damage. Dayco® Timing Belts, when replaced in conjunction with the tensioner, idler Pulley and oil seals, restore the optimum operating conditions for the timing drive system. All Dayco timing kit components meet or exceed OEM specifications. Most items are delivered within 1-7 days depending on size and location within Australia. Although we stock many thousands of product lines in our warehouse it is not possible due to space and financial restraints to stock all products that are actually available. If we do not have the product in stock there could possibly be a short delay of around 3-7 days to get the item into stock from the particular importers and dispatched and on its way. The item "DAYCO TIMING KIT WATER PUMP FOR NISSAN SKYLINE R32 R33 R34 GTR RB26DETT RB26" is in sale since Wednesday, August 17, 2016. This item is in the category "Vehicle Parts & Accessories\Car, Truck Parts\Engines, Components\Timing Components". The seller is "automotiveonline2012" and is located in BRISBANE, Queensland. This item can be shipped worldwide.